Click on the map here to bring up a larger copy. The red line is the loop course. Start and finish are near the Meadow parking area. The teepee is an icon of the loop and is provided by the generosity of Tony and Judy Godino who have brought it and put it up for every loop, rain or shine. UPDATE: new trails are featured in this 2012 update of the WPRR trail map: WPRsm_2012.pdf. And here’s a WPRR trail map with the Loop course overlaid on top: http://smu.gs/IB3eQy. Some parts of the Loop course go off the marked trails… If you are not familiar with the course you should go with a guide, maybe on one of our Sunday Runs! The Meadow start – a thundering herd of humanity sprinting, running, jogging, and walking towards the entrance to the woods. Runners hoping for a fast race should prep for sprinting this first quarter mile. “First Mud” – just inside the woods, runners encounter the first mud and/or wet. Don’t stop or slow down! Runners with prior loop experience will plow straight through knowing what is to come. Don’t forget to turn right at “Tommy’s Turn” (just before the bridge) or you risk crossing the river an extra time! Single track trails – after about 1/2 mile on the Fox Hill trail near the river, the course veers off the marked trails and narrows considerably. Runners encounter a steep section, large logs, stone walls, mud, and other steeplechase-like obstacles, making footing a challenge. First water crossing – come to a complete stop and don’t jump in, the bottom of the river is uneven with unseen rocks. Water height and strength can vary greatly from year to year. Help out your fellow runners and be helped out in return. The boardwalks – the other side of the first water crossing gets soggy quickly from all of the runners dripping off. The boardwalks keep some feet above mud but between them can be slippery! Fisherman’s Trail – on the other side of the road from Kimberly Bridge, this trail follows the river for a while then winds up and down a few hills. The Pit – the first of two sand hill climbs on the course. This is the smaller of the two so it will give you an idea of what is coming after the Mud Flats. Sullivan’s Surprise (occasional feature) – in 2010 we added another water crossing just before the mud flats at the point where the Waccabuc River and the Stone Hill River join up to become the Cross River. The further to the right you go, the deeper the water so STAY TO THE LEFT as much as you can. Watch out for a few big rocks and help your fellow runners get out of the river! This water feature is highly dependent on current water depth. If the water is too deep — and it frequently is — we will direct runners around this crossing. The Wall – site of a former quarry, this 45 degree climb is an anaerobic challenge that seems to keep going up up up. Keep your footing and take in the view of runners coming from below. Deer Hollow – back to one of the main trails in the Rez (marked with a “DH” trail blaze). The trail heads downhill after The Wall and gets wider — wide enough to pass without any problems. Mud washouts appear from time to time in the spring. It turns gradually north headed for a steady climb up to the highest point in the loop. Pine Forest – bright trails under leafless trees (in the early spring) yield to a majestic pine grove. The pine needles provide a nice cushion for weary feet and legs on this speedy but single track portion of the course. Take a deep breath… you have hit the 3/4 mark of the loop. Switchback “Cowgill’s Corner” and the River Run section – coming out of the pine forest down the hill you come to a switchback portion of the trail. Down the hill you are going southeast then at the river intersection, you turn nearly 180 degrees to the northwest. We have seen runners miss the trail tape and forget to turn so check your speed here! Small pine forest with storm damage – in spring of 2007 the tornado that brought down the Meadow Oak also ripped through this pine grove. The park has cleared the trail but be sure to note the destructive power of nature to either side of the trail as well as the “Devil’s Walking Stick” plants growing on the edge of the trail (don’t get too close, they have nasty thorns). Splashdown! – the final water crossing. In 2006 it had to be rerouted due to high water levels but for all other years this provided runners and spectators alike with a great (almost) ending to the loop. Runners go in muddy and sweaty and come out sparkling clean (not really)! A prime spot for photos and video for spectators – be courteous to others trying to get a shot too! The finish chute – at the site of the former Meadow Oak, the finish is now marked by the sculpted giant fallen limbs of the 500 year old behemoth and the Leatherman flags. Don’t forget to get your pink flag!! Also there are bagels, fruit, coffee, and Leather Man photo ops at the finish if he happens to be around. 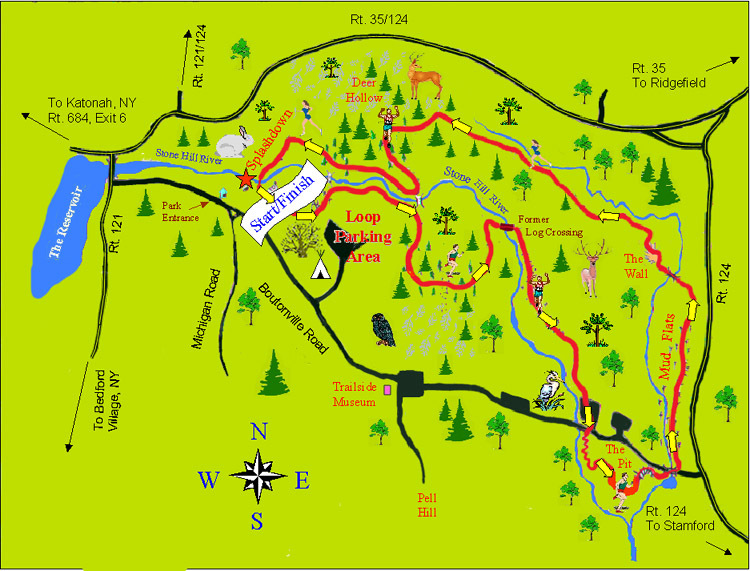 Download map of all trails at Ward Pound Ridge Reservation (updated in 2010 with new Rock Trail and in 2012 with several new intersections and connectors. ).